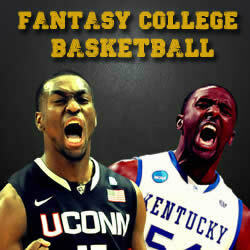 One of the toughest fantasy sports to try to create a fantasy team for is the NCAA March Madness tournament. Even when drafting a daily fantasy college basketball team at a site like DraftKings, you are faced with many more challenges than any other sport. Here are some March Madness Fantasy Draft Strategies that pro fantasy sports players use to help narrow down their choices when picking winning teams. Some are relevant for picking for a daily fantasy March Madness team, and some are relevant for picking in a March Madness Fantasy Pool. Because the brackets aren’t completely set until a few days before the March Madness tournament begins, you need to be wary if you are doing a draft before all the teams are decided. Don’t go out on a limb and pick a guy hoping that his team makes it in on the last day...by the time you do your pool, at least 95% of the bracket should be set. Draft fantasy players from teams that will be in the March Madness tourney for sure. Every team has a "go-to" guy. Although many NCAA college basketball teams play systems to even out the scoring, there are usually one or two players that will get plays run through them more than others. An important March Madness fantasy draft strategy is to know who these players are for all the teams in the tournament. Some players will get injured during the run up to March Madness. They may be small injuries, but the team may rest that player in the 1st round if they deem the opponent too easy. Even lingering injuries may affect the player so keep an eye on the injury reports. Don’t load up on "Underdogs"
Everybody loves a March Madness sleeper pick or a Cinderella team, but not all the March Madness sleeper picks pan out. If you know your college hoops well and are certain that a team will win a few rounds, then go ahead but be realistic. This is really March Madness fantasy strategy 101 - picking a fantasy team of 13-16 seeds will get you knocked out of your March Madness fantasy pool quickly. An important fantasy draft tip for any daily fantasy sport is to know the opposing team that your daily fantasy players will be facing. There are very offensive minded college teams and some that win by playing defense. Coaches may have to adapt their style to win the game. If you are focusing on a top scorer going against a defensive team, that scorer may not get the points to help you out (they may even cost you points if they miss too many field goals). Know what the matchup is scheduled to be like before making your final picks. When you are making picks playing daily fantasy March Madness games at FanDuel, be wary of players on top seeded teams. That player is only yours for that one night, and picking a scorer on a #1 seeded team that everyone predicts will blow out the opponent is dangerous because that top scorer may sit half the game instead of risking injury. Blowout games can kill your daily fantasy NCAA team if your player only plays half the game. A March Madness fantasy draft strategy for full tourney NCAA pools is to make sure you have players from several teams and in this case regions. If you load up on players all in the same region or section of the tourney, you will eventually lose almost all of your players. Keep a balance of players from all 4 regions to keep them alive as long as possible. Also, try to avoid picking players facing each other in the first round so that you at least have a chance to have your fantasy players play 2 games. Just like when filling out a March Madness Bracket, being able to predict the Final Four and loading up on those fantasy players will put you in the lead of your pool. Picking mostly players from the finalists will almost guarantee the win. Make a bracket and follow it when playing in a March Madness fantasy pool. Looking for a list of sites that offer Fantasy March Madness contests for the tournament? Check out RealMoneyFantasyLeagues.com and the list of March Madness Fantasy Leagues.